3 Ways to Make Disney's Toy Story Land the Ultimate Playdate for Kids and Adults! 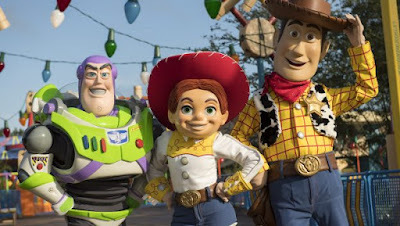 Brilliant and lively, Toy Story Land is now the place to play with Woody, Buzz Lightyear, Jessie and all of the Toy Story friends in a much larger-than-life recreation of Andy’s backyard. 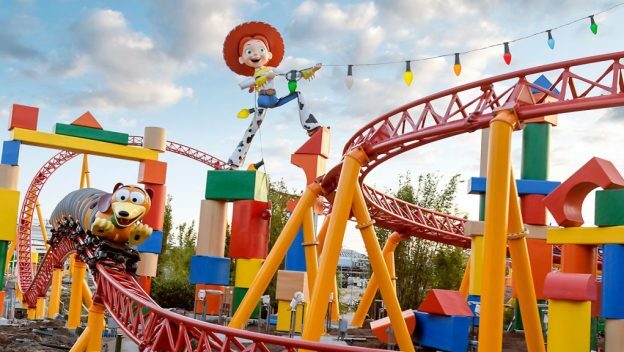 Toy Story Land, newly added to Disney’s Hollywood Studios kids and kids-at-heart will find plenty of colorful building blocks and game pieces to play with throughout the entertaining new attractions, experiences and adventures based upon the classic movies in the Toy Story series. 3 Ways to Make Disney's Toy Story Land the Ultimate Playdate for Kids & Adults! Keeping in-the-know about Disney Destinations, our pixie dust partnership with the experienced Disney Destinations Specialists at EZ Dis by Instant Impressions Travel Services, keeps me in-the-know with Disney insider tips, plus ways to plan your Disney Vacation with money-saving travel hacks for any and every budget. Sandy Nussbaum Giercyk, Disney Destinations Specialist with EZ Dis by Instant Impressions Travel Services, offers insight into preparing ahead for your next visit to Toy Story Land or other Disney Theme Parks. 1 - Slinky Dog Dash (Guests must be 38" or taller) Andy’s assembled his Mega Coaster Play Kit—Slinky Dog is gonna take you on a wild, toy-filled adventure. Get a glimpse of everything Toy Story Land has to offer as you stretch Slinky Dog’s coils to the limit across Andy’s backyard! Come along for a roller-coaster-style ride as he bends and twists and stretches his way all throughout this new land. Make no mistake, it’s a wacky attraction the family is sure to enjoy! 2 - Alien Swirling Saucers (Guests must be 32" or taller) Blast off on an interstellar romp, set to an out-of-this-world beat! 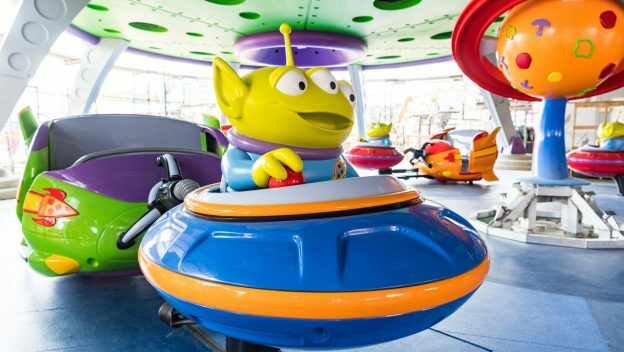 Inside a play set that Andy won at Pizza Planet, the Aliens have powered up their flying saucers— and they’re ready to spin you on a wild ride into space! Hold on for some wild fun as your toy rocket takes off, all while electronic space music provides an intergalactic soundtrack. If you’re really lucky, you might just get “chosen” by the claw. Oooooo! 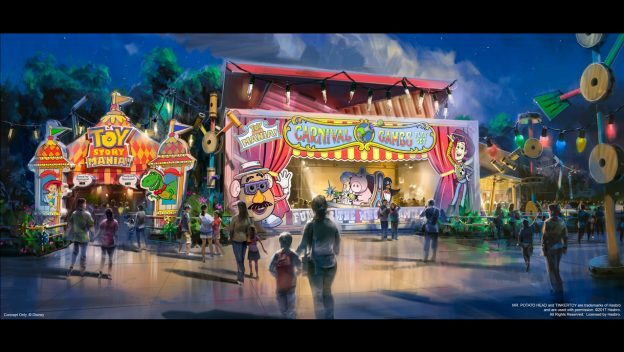 3 - Toy Story Mania (Guests can be any height) Zip through a virtual gallery of exciting carnival games based on the hit animated film series. Step inside Andy’s room and wind your way through a toy treasure chest of classic playthings. Pass a Candyland® game box, Viewmaster® discs, crayon drawings and a Scrabble board before picking up a pair of special 3D glasses for the fun to come. Hamm & Eggs - Hamm and Buttercup invite you to knock down both moving and stationary barnyard animal targets using hardboiled eggs. Rex & Trixie’s Dino Darts - Launch darts and pop balloons in front of a bubbling volcano in this game starring Rex and Trixie. Green Army Men Shoot Camp - Toss baseballs to break plates at a green army men firing range. Buzz Lightyear’s Flying Tossers - Buzz Lightyear urges you to toss rings and make them land atop the Little Green Men. Woody’s Rootin’ Tootin’ Shootin’ Gallery - Shoot suction-cup-tipped darts at a variety of mine-cart targets in this game inspired by the “Woody’s Roundup” television show. As each game is completed, your Carnival Ride Tram will quickly rotate and slide onto the next game. Compete with friends for the highest score or try to achieve a new personal best! But remember, whether you’re an expert or a beginner, everyone’s a winner!